UPDATE (February 15, 2013): According to random.org, the winner of the giveaway is…Melanie Conklin! Congratulations, Melanie! I’ll be contacting you to help you claim your prize. Thanks to all who entered! Each January, I’m excited to see which books win the ALA youth media awards. (Click here for a complete list of this year’s winners.) When my kids were younger, I looked forward to seeing who won the Caldecott Medal and the Theodor Seuss Geisel Award. But now that I write middle grade and read so much of it, I anticipate the Newbery announcement most of all. And this year, I was more excited than ever. I had my secret predictions, but none of them were firm. My favorites, however, were pretty firm, and you can see them in this post from last December. So imagine how thrilled I was when one of my favorites actually won the Newbery! Imagine how cool I felt when I realized that Katherine Applegate had seen my post and liked my post and retweeted a link to it! Whatever you’re imagining, triple it. Now triple it again. Now you’re getting close. I was excited to think that I had some tie to a Newbery winner, but mostly excited that a book I loved so much had gotten such an awesome recognition. Ten days later, I’m still beyond thrilled for the lovely (and absolutely deserving) Katherine Applegate and her touching, timeless book. The One and Only Ivan should be a book that kids read for years and years to come, and I’m so glad that the Newbery hardware will help make it so. 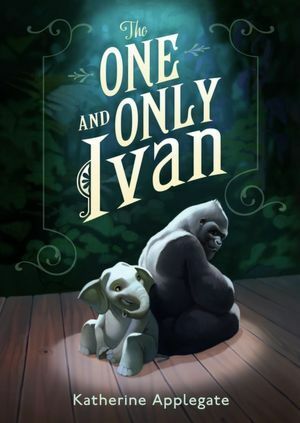 And so, dear readers, I’m giving away TWO copies of The One and Only Ivan to one lucky winner! One is yours to keep, and one is yours to give away to an elementary school classroom of your choice. Follow my blog, The Middle Grade Science Project. Like Thinking Through Our Fingers on Facebook. Tweet about this giveaway, or post about it on Facebook. When you’re done entering, leave a comment here to let me know how many ways you’ve entered. That’s it! I’ll choose a winner one week from today. Very cool! Let's see. I follow both blogs, 3 people on twitter, and I tweeted about it. So is that 4 entries or 6? I retweeted your giveaway – so that gives me one – since I am a literacy coach for elementary students – I don't follow high school very often! I tweeted about your giveaway, follow both blogs, and I follow the contributors on Twitter. Thank you for the giveaway. I fell in love with The One and Only Ivan, and so did my class.